There is a double edge to the exhibition title Martin Sharp: Sydney Artist, because Sharp is one of the very few Australian artists who enjoys a worldwide reputation. This is no mean feat for a man who says he has barely left his house for the past forty years. It remains a mystery whether he is happy to be a “Sydney artist”, or is somewhat rueful about the title. The exhibition at the Museum of Sydney is the latest in line of survey shows that have appeared every decade or so, if only to remind us of Sharp’s existence. His most recent exposure was a 2006 show at the Ivan Dougherty Gallery called The Everlasting World of Martin Sharp. Prior to that he was an integral part of the Yellow House exhibition at the Art Gallery of NSW in 1990. 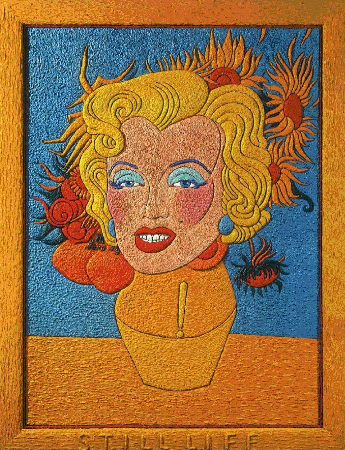 His outing before that was at Roslyn Oxley9 in 1987 with a show he called A progressive retrospective. In fact, every exhibition in which Sharp has been involved for the past 20-30 years has been a progressive retrospective. Those who have seen the previous shows, not to mention the permanent hang in Sharp’s house, will recognise many of the pictures. Perhaps this is appropriate for an artist who deals in nostalgic, iconic images. Don’t feel distressed if you feel like you’ve seen it all before – Sharp is a master of familiarities, not novelties. With the current show, Ace Bourke is credited as the exhibition co-ordinator, but can anybody co-ordinate Martin Sharp? 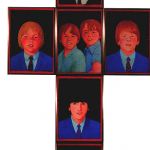 The MoS show gives the impression it is largely self-curated – a rambling visual autobiography on shocking blue walls that takes us from the artist’s schooldays at Cranbrook, through the swinging sixties in Sydney and London, and finally back to the seclusion of the family home in Bellevue Hill, where all Sharp’s fondest obsessions have been incubated. 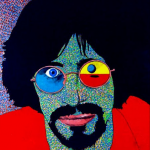 Sharp first came to attention in the sixties through his brilliant satirical drawings for Oz magazine in Sydney and London. 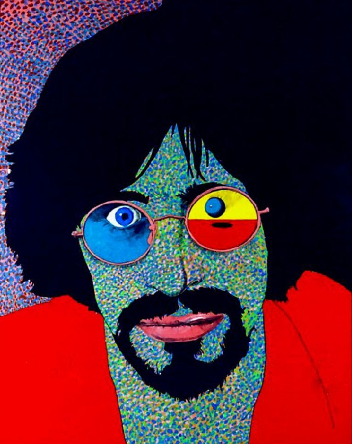 His distinctive blend of graphic art and collage, often described as “psychedelia”, seemed to define a period of excess and creative freedom, through his album covers for Cream, his posters for Bob Dylan and Jimmy Hendrix, and his Gathering of the Heads poster, which advertised a Hyde Park rally for the legalisation of marijuhuana. What a trivial issue this seems today, with climate change and terrorism dominating the headlines, but in 1967 it was perceived as a vital part of the civil liberties agenda. To say Sharp lives in the past is not strictly true. It would be more accurate to say that for him the past remains permanently alive. As his early works become further removed in time, he enjoys them more and more. It is almost as if they were painted by someone else. Some of those paintings seem to go on forever, such as the three-metre long Film script, dated 1976-2004, or Abalone, his sublime homage to Hokusai, dated 1990-2006. With major works this protracted approach is the norm not the exception. At any time Sharp might choose to revisit a supposedly finished painting and add another layer. This is one of the reasons why people will tell you how strange or eccentric Martin is – he is unconcerned about being ‘productive’, about holding exhibitions, making sales, or furthering his artistic reputation. Fame he has sufficient to his needs, and fortune he has cheerfully squandered. Sharp has all the makings of gargantuan commercial success, and not the slightest interest in pursuing it. He is an intensely private person devoted to public causes. After all these years there is no decent book on Sharp’s work, and not even a catalogue for the MoS show – largely due to the artist’s own resistance. When he was in hospital recovering from a bypass a few years ago, he began to reflect on what a big mess he had made. Having recovered and got back to work, he seems as comfortable as ever with that congenial mess. Sharp is a man at the mercy of his obsessions. One of those obsessions, Tiny Tim, virtually bankrupted him, as he poured a decade’s worth of time and money into the film, Street of Dreams, which was finally released in 1988. Twenty years later, Street of Dreams has yet to make it to DVD, while Sharp’s monumental collection of Tiny Tim recordings has resulted in three albums and a sampler. These recordings are not readily available in the shops, but can be purchased at the Museum of Sydney during this exhibition. The big question is: “Does anyone want to listen to Tiny Tim nowadays?” I’ve found these discs have a polarising effect on people, who either love them or loathe them. Yet this does not phase Sharp, whose faith in Tiny’s genius is unquenchable. Equally relentless is his anger at the fire that ravished the old Luna Park in 1979. 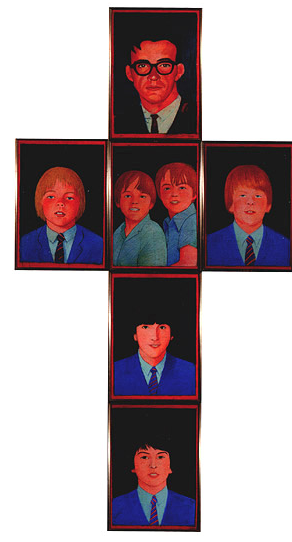 In Golgotha (c.1987), he used a crucifix format to memorialise the school teacher, John Godson, and his six pupils, who died when the Ghost Train went up in flames. To Sharp there was never any doubt that the fire was an act of sabotage, intended to close the park down so the site could be taken over by developers. Given the woeful history of Sydney’s urban high-rise, this is not so far-fetched. If the park remains alive today it is largely because of the agitation Sharp spear-headed. In 1990, when he transcribed the word Eternity onto a five-metre sign for a store in Darlinghurst, Sharp tapped into some deep part of the city’s collective psyche. Eternity had been the trademark of the religious loner, Arthur Stace, who had spent over thirty years writing it in chalk all over Sydney. 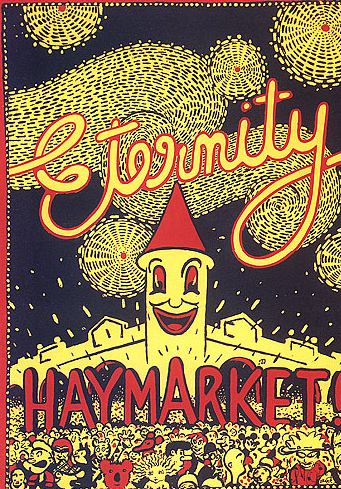 Sharp had already used the word in his iconic print, Eternity Haymarket!, made in 1978 when arguments were raging about the re-development of the old market area. The logo would go on to adorn the Sydney Harbour Bridge in 1999, and be featured during the Opening ceremonies of the Sydney Olympics in 2000. The way Sharp brought new life to one infinitely suggestive word represents his most spectacular success from many forays into appropriated imagery. 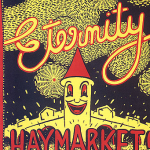 In Eternity Haymarket! the starry sky is borrowed from another of Sharp’s perennial heroes, Vincent Van Gogh. The army of cartoon characters and comic figures in the street is nothing less than an anthology of Australian popular culture. One of the magical aspects of Arthur Stace’s “Eternity” is that it was a message of cosmic import conveyed in the most ephemeral of mediums. Stace’s Eternity led a furtive, underground existence, but Sharp brought it out into the light, making it an ironic symbol of a city perpetually in the throes of destruction and renewal. Had he written “Mammon” in the same cursive script, it might have been more truly representative of the spirit of Sydney. Although Sharp’s posters exist in the thousands, many of his important paintings remain in own possession, where they are jealously guarded from the prying attentions of dealers, collectors and fans. He is absolutely sincere in his admiration for ‘holy fools’ such as Van Gogh, who devoted himself to painting with manic intensity, selling almost nothing during his lifetime. Sharp believes that art is not a commercial activity, but a way of communicating heartfelt spiritual and political truths. In recent years, he has combined those two poles with works that pursue the theme of indigenous justice, from a simple wooden crucifix painted in the colours of the Aboriginal flag, to a vibrant appropriation of an 1888 drawing by Phil May of The Bulletin, in which an Aboriginal woman is treated as “a curiosity in her own country”. This may sound a trifle dogmatic, but Sharp is far too various in his interests, too much of a born satirist, to get caught up in the process of sending messages to the viewer. Throughout this chaotic, encyclopaedic exhibition, one keeps stumbling across shrewd little vignettes that speak more eloquently that some of his grand statements. It’s hard to imagine a more succinct comment on Australian culture than the cartoon character, Boofhead, saying: “But I don’t give a stuff about opera!” This drawing appeared at a time when Jorn Utzon’s vision for the Opera House was being dismantled by local bureaucrats. Perhaps there should be a set of Boofhead awards for crimes against culture. I’d be happy to nominate the American director, Christopher Alden, for the clichéd, totalitarian version of Tosca he recently foisted on Sydney audiences. Martin Sharp is emphatically someone who does give a stuff, in a country where the arts are treated with grand indifference. For all the frustrations he inflicts on his friends and admirers, there is nobody like him – nobody who has given up the entire world in order to be a Sydney artist. Like Vincent Van Gogh, in the word balloon that emerges from one of Sharp’s collage works, there are moments when he sees with a terrible lucidity.